The word “Gabbeh” translates into something natural, rustic, raw, and organic in the Farsi language. For centuries the women of the Luri and Qashgai tribal groups have woven Gabbeh rugs to outfit their homes and as wedding gifts. Traditionally they were used for sleeping in the yurts as the nomadic tribes moved around what is now Southwestern Iran. Today the women of the Luri and Qashgai, as well as their subgroups, the Amaleh, Shekarlou, and Khamseh, still improvise their rugs. The designs often depict their natural surroundings and can include images of people, animals and landscapes. Often they are made the old fashioned way, with vegetable dyes and long staple, hand spun wool. 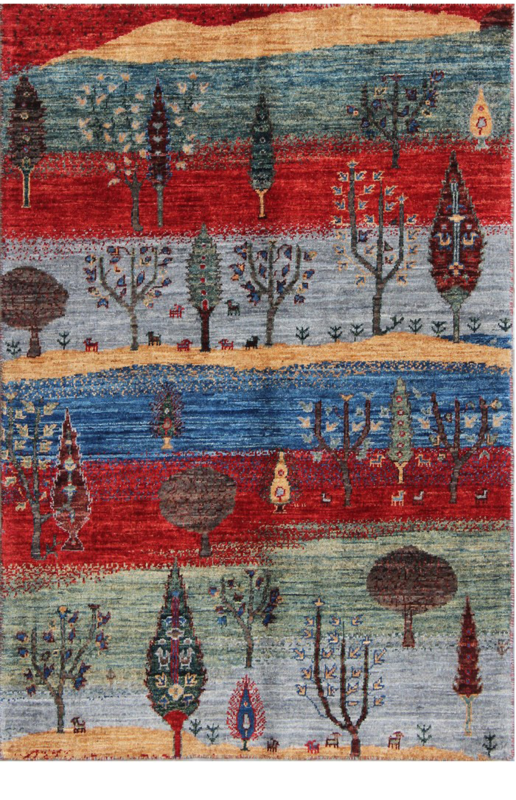 These are the opposite of the more formal classical designs of Persian “city rugs”. They are relaxed and full of life. They tend to look great in in a traditional home or amidst modern decor. Because of their recent “discovery” by the West, they are now woven in all of the major rug producing countries in modern colors.